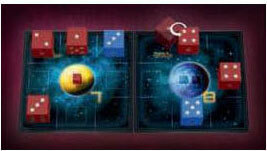 Midway into a game, two players are trying to construct quantum cubes on a size 8 planet. The Red (Vulpes) player has already expanded his fleet to 5 ships. 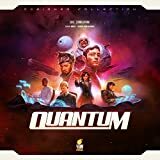 The Vulpes Alliance wants to move a ship into position to construct a quantum cube. The 6 is in range - the next step is to move it into position and then reconfigure it into the right number. For the first of his 3 actions, Vulpes decides to MOVE his ship 5 spaces. Ships can neither pass through nor land on planets, and ships cannot pass through other ships. Each ship has a different special ability it can perform, and Vulpes uses the 6's FREE RECONFIGURE ability, which lets you reroll the ship. He rolls a 1. A special ability never uses up one of your 3 actions for a turn - so Vulpes still has only used 1 of his 3 actions. Vulpes wants dice that total 8 in orbital positions around the planet. The rerolled 1 doesn't help. So he spends his second action to RECONFIGURE the die again - this time rolling a 4 - exactly what he needs! Constructing a quantum cube takes 2 actions, and he only has 1 action left. So for his third and final action, Vulpes decides to add 1 to his RESEARCH. When research reaches 6, you can pick an advance card. Vulpes hasn't earned any card draws for the advance cards phase this turn, so his turn is over. Kepler sees that her opponent will be able to construct next turn - so she moves in to attack. She might be able to construct a quantum cube too! 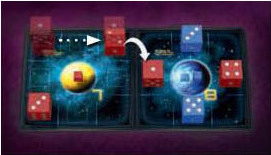 Kepler attacks, moving her blue 3 into the space with the red 4. Both players roll combat dice: the black weapons die is a 3 and white defenses die is a 2. Adding their ship numbers, the blue total (3+3) is the same as the red total (4+2). The attacker wins ties, so the attack succeeds. The 4 is destroyed and goes to the Vulpes player's scrapyard, where it is immediately rerolled. Kepler chooses to move her 3 into the space she attacked (she could also choose to move it back to the space from which it attacked). As a result of the attack, her dominance goes up by 1 and the Vulpes dominance goes down by 1. When dominance reaches 6, you can place a quantum cube on the map. For her last two actions, Kepler CONSTRUCTS a quantum cube on the planet.She can do this because her 3 and 5 in orbital positions add up to 8, which exactly matches the planet number of 8. She places a quantum cube from her command sheet onto the map. Constructing a quantum cube uses up 2 actions, so Kepler has used up all 3 of her actions. 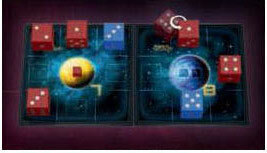 Because she constructed a quantum cube, in the advanced cards phase of her turn, Kepler picks an advance card. She chooses the AGGRESSION gambit card, which immediately adds 2 to her dominance. It looks like Kepler has ruined Vulpes' plans for a quantum cube on the planet. But... there is still a way to use several ship abilities in combination to build a cube. The Vulpes player begins by using the 2's special ability of TRANSPORT. The first step is to "pick up" the ship that is going to be transported. So the Vulpes player puts the 1 on top of the 2. Transport uses the MOVE action of the Flagship, so the transport will cost 1 action. The 2 moves two spaces, and then "drops off" the 1. A flagship can pick up and drop off ships in any surrounding space, so Vulpes is able to drop off the 1 in a diagonally adjacent square. This puts the 1 in an orbital position. Using the WARP power of the 3, the Vulpes player swaps the 3 with the 1. This is a special ability use and doesn't use up an action. Making use of the MODIFY power of the 4, the Vulpes player changes the 4 to a 5. This is another special ability and so also doesn't use up an action. Despite all of this activity, the Vulpes player has only used up 1 of his 3 actions so far. His dice in orbital positions add up to 8, which matches the planet. He spends his final two actions constructing a quantum cube. The Vulpes player gets a card in the advance cards phase of his turn. He chooses the BRILLIANT command card and attaches it to the right side of his command sheet.